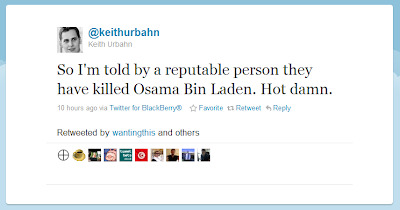 ThinkHammer: Tweet delivers first public message of Osama Bin Laden's death. Will we remember that? Tweet delivers first public message of Osama Bin Laden's death. Will we remember that? According to a story on Adweek, moments before President Obama stood before reporters and delivered the news that Osama Bin Laden had been located, intercepted and killed in a private military compound in Pakistan, the story had been leaked on Twitter. 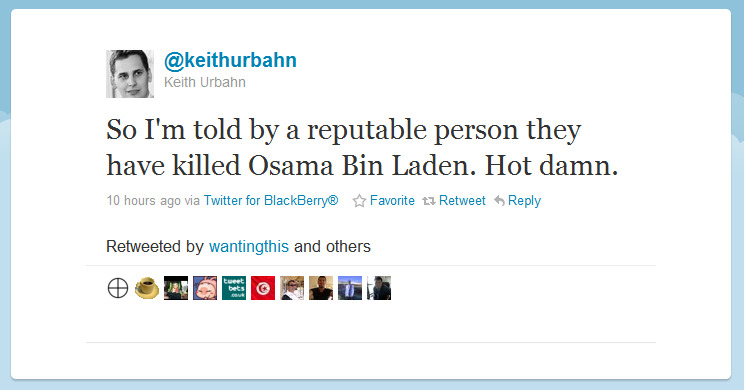 It seems that Donald Rumsfeld's chief of staff, Keith Urbahn, posted it to Twitter. It's hard to say whether history will care much about his being first to announce it publicly. Urbahn said in a later message that he got the news from a TV producer, so I think it unlikely that this is some sort of herald of the death of TV news. It does however seem to be a frameable tweet. Someone who knew something that we didn't was overwhelmed by the moment and posted it where others could see. It's absolutely poignant. That may make it something we will all remember.